TRENTON, N.J. (WPVI) -- New Jersey Gov. 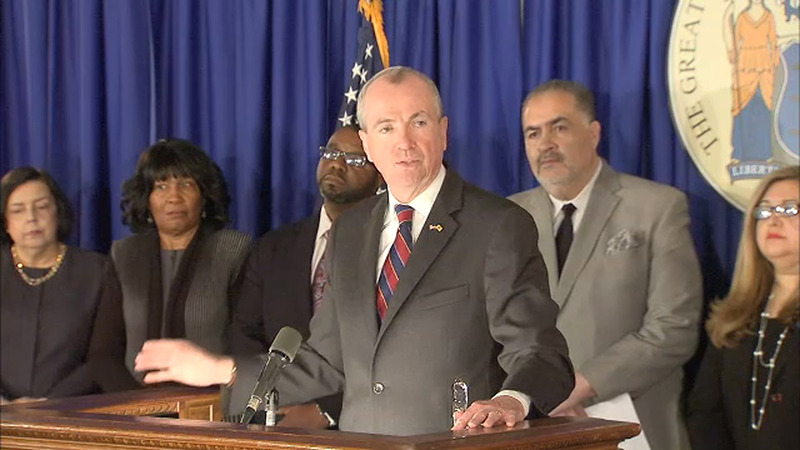 Phil Murphy says the votes in the Legislature are not yet there to legalize recreational marijuana. The Democrat said at news conference Thursday that he and legislative leaders are "making progress" convincing lawmakers that they should back the measure that's up for a vote Monday. Murphy and fellow Democrats Assembly Speaker Craig Coughlin and Senate President Steve Sweeney support the measure that legalizes recreational cannabis for people 21 and over. But some lawmakers have expressed their reluctance to support legalization, and the vote's outcome on Monday is uncertain. If the measure passes, New Jersey would become the 11th state along with the District of Columbia to legalize recreational weed. The measure imposes a $42 per ounce tax, sets up a regulatory commission and expedites marijuana-related expungements.